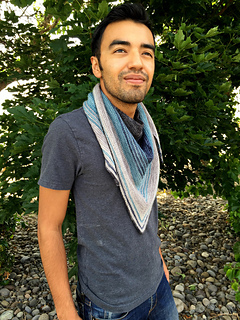 I designed this shawlette when I discovered five leftover skeins in my stash that formed a nice gradient when I arranged them together. 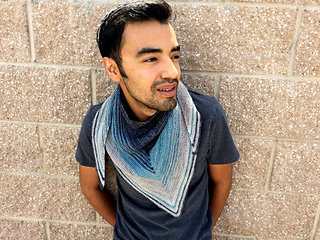 Basic increases form a triangle shawl in garter stitch arranged by color. 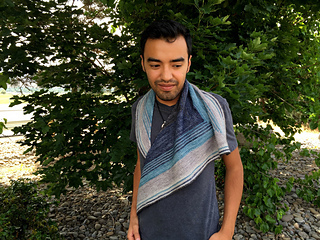 Aside from the many rows of one color, breaks of basic intarsia striping halfway through the rows break up the colors for a slightly asymmetrical look, then more stripes are worked before an I cord bind off completes the shawl. This project is designed to use 100 yards of each color, and each is used as much as possible without running out. 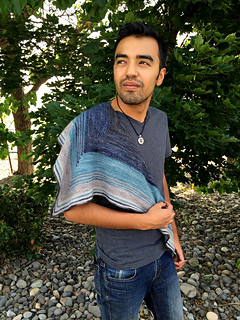 Look through your stash and see if you can come up with a nice gradient of colors or whatever you see fit to knit this quick accessory. 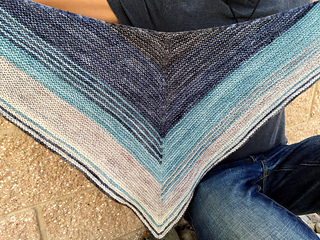 PATTERN NOTES: This project is designed to fit 100 yards of each color and no more. Color D is the only color that will cut it fairly close, as I only had about 20 yards left. Check your gauge before beginning work, or be sure you have more than the required amount..
Wingspan is about 48”, and 17” from cast on edge to deepest point. About 12 sts and 16 rows in garter stitch, every 2 inches.